Slip on design, easy to pull on and off. 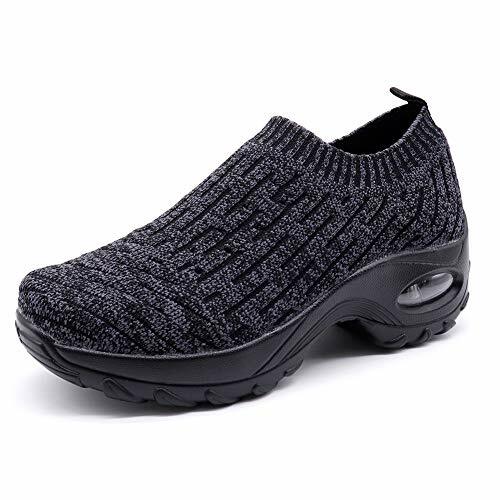 Comfortable knit upper with elastic band, more flexible and breathable, offering you a superior good foot fit. Non slip rubber outsole, with good grip, arch support and traction, makes it more comfortable for walking,work,travel,trip and standing for a long time. The height of the heel (air cushion design) is about 2.28inches, comfortable and durable, featuring with superior cushioning performance, relieving fatigue. These stunning womens sports shoes are suitable for any seasons,go well with all outfits.Perfect for working, walking, casual, dress, shopping, travel, long time standing, driving, running, etc.